I did this illustration over the weekend for Lucy Sisman and Tamara Glenny, my editors at Wwword.com. 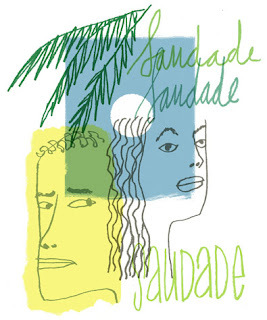 To get myself in the right frame of mind for a Brazilian term I listened to Jobim and Luis Bonfa and Joao Gilberto for a bit and thought to myself that it was getting warmer in Brazil right now as it's getting colder here. Then we sat down and watched a Brazilian film ("The Year My Parents Went On Vacation", which I highly recommend.) The trick of illustrating an untranslatable word involves the same difficulty as translating it: it's complex or ineffable or, more often, a case of "you had to be there"; or it's all three. 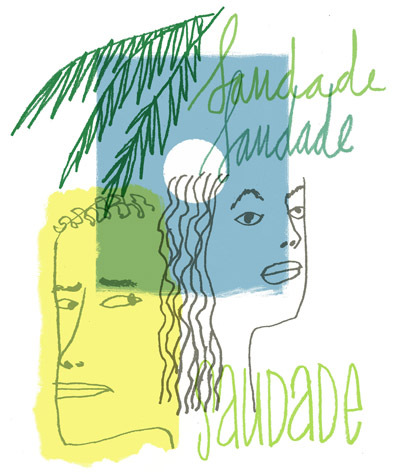 You'll understand the word "saudade" better after reading this month's Untranslatable column. The illustration is almost as helpful as a few hours listening to Jobim. Eric, I am a brazilian living in Chile. So I do know the meaning of the word saudade. I came to your blog after reading an interview of you over at From the Desk of… via http://www.pikaland.com/. I simply loved your style or, even better, your mix of styles that suggested me that your main tool of work is the freedom with which you nurture your thaughts. The cords of the guitar/moon separate the couple that are also kept apart from the day/nigth dicotomy, under the shadow of a cocunut folliage. Great, simple, beuatiful. Congratulations.